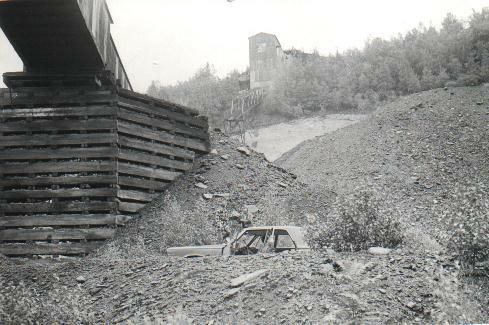 Most of these pictures were taken in northeastern Pennsylvania from 1969 to 1971. While cleaning off the old bulletin board, I came across these older pictures that I thought you might like to see. 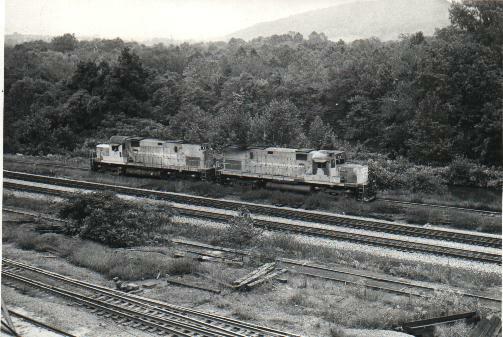 A pair of Lehigh & Hudson River ALCo C-420's drift by the "light side" hump in the Jersey Central's Allentown Yard. The L&HR used the CNJ from Easton to Allentown, PA to make its interchange connection. 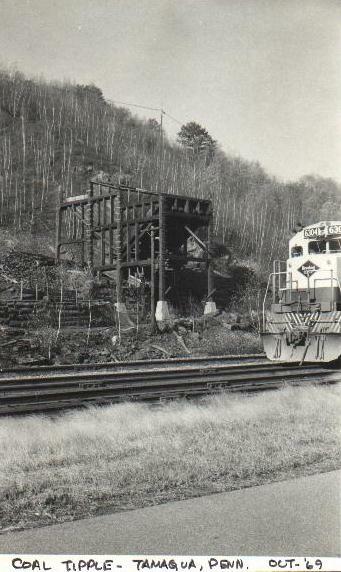 The photo was taken from Central Blvd., which still provides safe train-watching, though Norfolk Southern has replaced the CNJ and you have to travel to Arkansas to see a L&HR C-420. 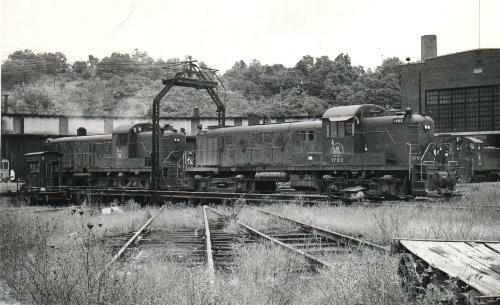 An ALCo RS-3 and RSD-4 roll off the turntable at the Jersey Central's Bethlehem Engine Terminal, part of the road's Allentown, PA area complex. 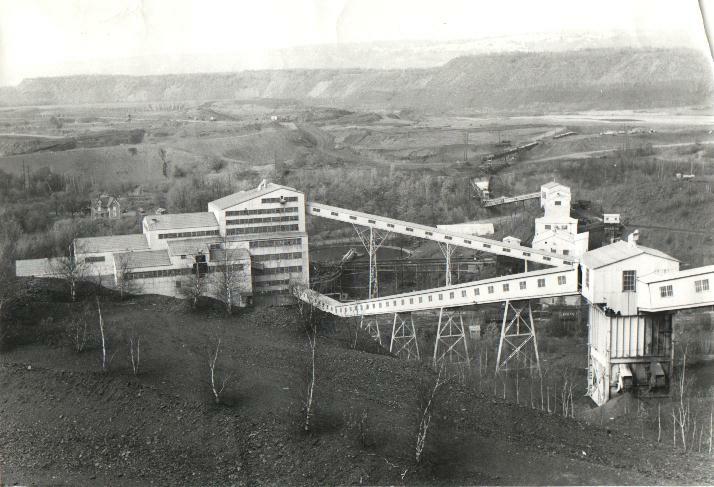 Used over the course of time by the CNJ, Reading, Lehigh Valley, Lehigh & Hudson River and Conrail, the historic facility was demolished in late 1998. 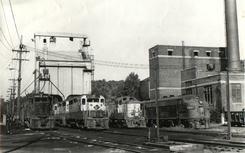 The CNJ's Bethelehem, PA engine facility plays host to a sampling of first and second generation power in this photo from the summer of 1971. 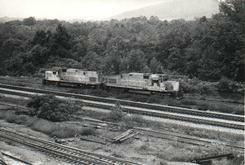 On the far left, CNJ SD-40 3066's plain-jane paint scheme belies her past as B&O #7487. On Conrail she wore #6290 until a 1993 rebuilding into an SD-40-2E #6999. RS-3 is one of dozens used by the coal-hauler system-wide. 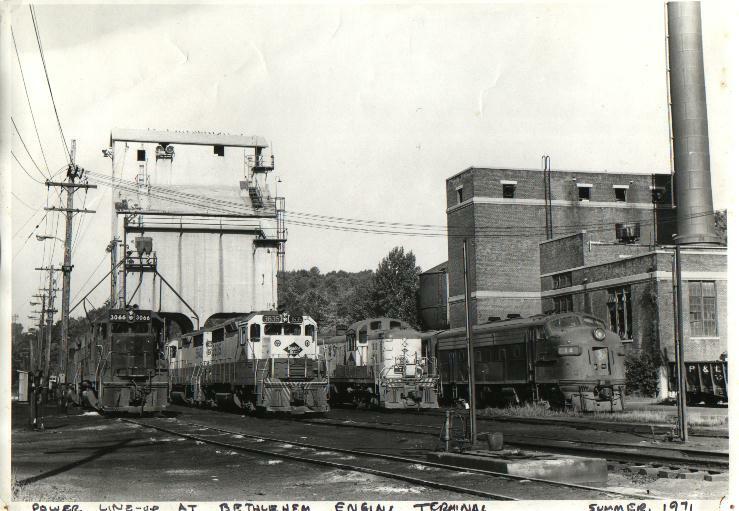 Finally, on the far right is CNJ F7A #14, formerly B&O #4582, a 1952 EMD. The F-units were pretty well beat by the time the B&O sent them to bail out the CNJ, and they did not last through the Conrail take-over. Note the breaker way, way, way up the top of the hill. Another one we're trying to remember where it was. The sleepy little town of Jim Thorpe PA. 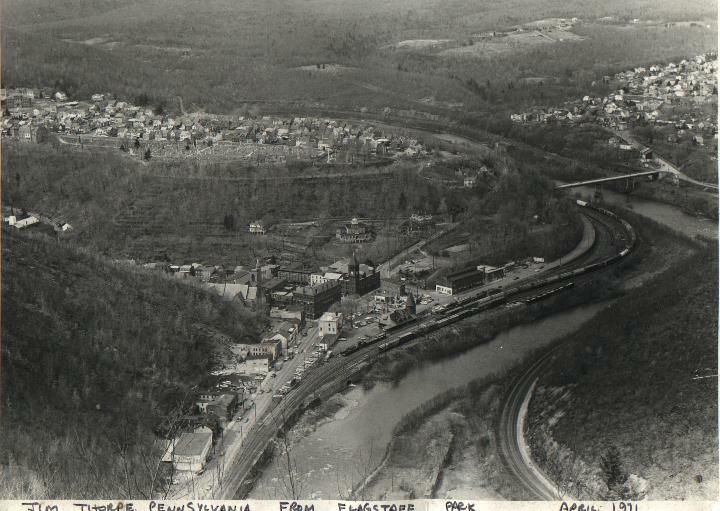 The only difference between this photo from April of 1971 and today is a water treatment plant in towards the bottom right of the photo. 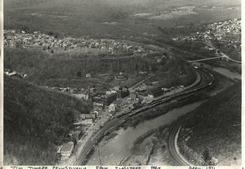 D&H mainline on the right side of the Lehigh river, CNJ on the left. The photo was taken from Flagstaff park. 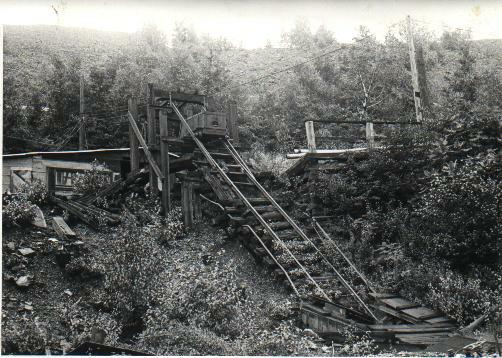 Can you believe that they used to pull coal up from the mine shaft on this rickety track? The big one...Here's the St. Nicholas breaker in April of 1971. This one was just monsterous. The back side of the breaker. This one shows how spread out this facility is. A bigger version of STNICK1. 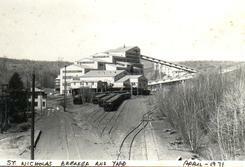 This one shows the mine hoist off on the right and the power plant off to the left. 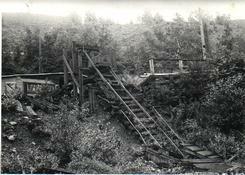 An old coal tipple in Tamaqua PA from 1969. Not in the same league as St. Nick.